SUPERSTAR steeplechaser Don Cossack had a stroll in the sunshine at the Maze to win the Champion Chase on Saturday. Although a comfortable winner, the leading Gold Cup fancy didn’t look as impressive as on his Punchestown debut. That was an opinion echoed by his trainer Gordon Elliott. "He only had a school around. Bryan [Cooper] said he never came out of second gear but at the same time, he never took hold of the bridle,'' said Elliott. The Don joined his brave little stable companion Roi Du Mee four from home after which the result was never in doubt. British challenger Rocky Creek, second last year, was under strong pressure in the last mile and only denied Roi Du Mee (winner of the £140,000 Grade 1 chase in 2013) by a head for the runner-up spot. The locally-owned Texas Jack was last of the four runners in the feature sponsored by the Maze chairman Jim Nicholson under his JNwine.com title. 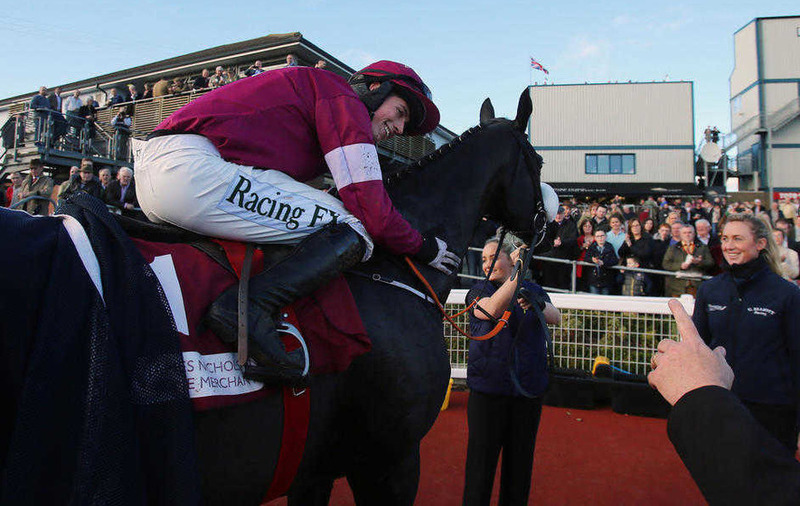 Don Cossack is quoted at 6/1 for next year’s Cheltenham Gold Cup with Elliott adding: "Kempton [King George VI Chase] or the Lexus [Leopardstown] and the Gold Cup then Punchestown [Gold Cup], if everything is okay. "He's a good horse, so we have to mind him. I wouldn't swap him for anything." An interesting footnote to Saturday’s big race win was that Downpatrick trainer Brian Hamilton had been invited by Elliott to see his facilities and stable complex, only to find himself giving Don Cossack a canter twice round the all-weather gallop which thrilled the former Northern Region Champion points rider. He can now claim he put the finishing touches to the top-rated chaser prior to his appearance on Super Saturday. Maze manager Mike Todd said yesterday: “ I’m delighted overall with this year’s event. Friday was up 1,700 on the day and we held our own on Saturday despite the Ruby attractions and the Halloween date. “The quality of racing was superb and I’m certain many of the horses that ran over the two days will be Cheltenham Festival contenders next March. Paul Nicholls has been a great supporter of the Lisburn course and Ptit Zig won the Grade 2 Powers Novice Chase for the seventh time for the British champion trainer. Winning jockey Sam Twiston-Davies said: "It probably wasn't one of my finest rides - we were all gathered up together and I almost panicked a little, kicked him in the belly and he just took off. The top rider had a hectic journey to the course due to a delayed flight and regretted not having been able to walk the course. The big Irish names, Clarcam (second) and Shanahan’s Turn (fourth), appeared to under-perform. But Armagh trainer Keith Watson, who ran four in the supporting feature, obtained his objective of collecting £2,500 in prize money when Finea and Raydari filled fifth and sixth respectively. Gordon Elliott completed a hat-trick on Saturday having won the opener with an exciting French import Miss Tata on her debut for the Irish trainer. Elliott is considering a mares novice contest at Aintree next for the juvenile which looks the best of that age group in Ireland or Britai. Elliott concluded the day with a runaway success by Death Duty in the finale giving the top trainer a total of five winners during the festival. Ryanair’s Michael O’Leary matched the tally with Identity Thief, trained by Henry De Bromhead, having landed the first-day feature.